This is one of those super simple recipes I turn to when the fridge is pretty much empty but I need to make a real meal. 1. Don't cook your pasta past al dente. That's slightly firm, 'to the tooth.' If you're still cooking your pasta to the point where it's completely soft or (god forbid) mushy, don't bother. It's ruined and doesn't deserve to be treated nicely. 2. Use GOOD quality olive oil. Don't buy it in bulk, don't pay less than $10 a bottle, if it's not dark green you're doing something wrong. Try O-L!ve. Other than that, go nuts. This time I used asparagus and parsley. My mum loves it with all the vegetables that are in the fridge drawer. If you like the ingredient, use it! Gently toast your breadcrumbs and garlic together until golden brown. Remove from heat. Sautee your vegetables with evoo, until tender. 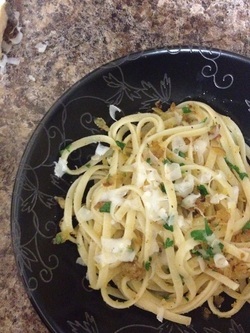 Toss the crumbs, parmesan, pasta, vegetables etc with the pasta, drizzle with olive oil. Season to taste with salt and pepper. PS. This one's even better the second day!